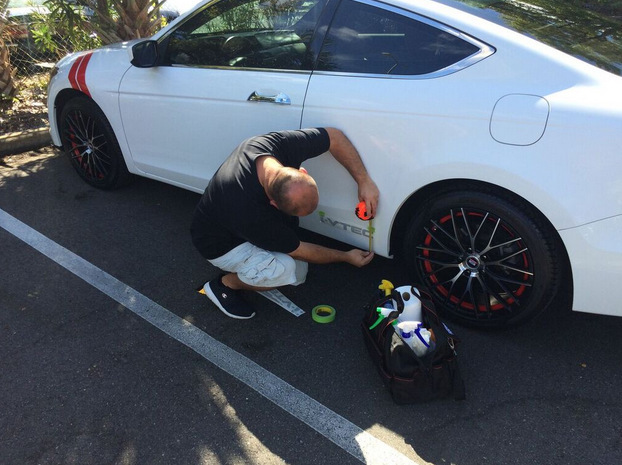 One of Our Clients Customizes Honda Accord with Vehicle Graphics! At Citrus Sign Studio, we are frequently asked whether we produce vehicle graphics for personal cars in Orlando, FL. Or, do individuals have to be affiliated with a business to get work done? While the vast majority of our projects are for organizations, we definitely enjoy producing and installing graphics and decals for personal vehicles. Read on to learn about a job we just completed for an area resident. 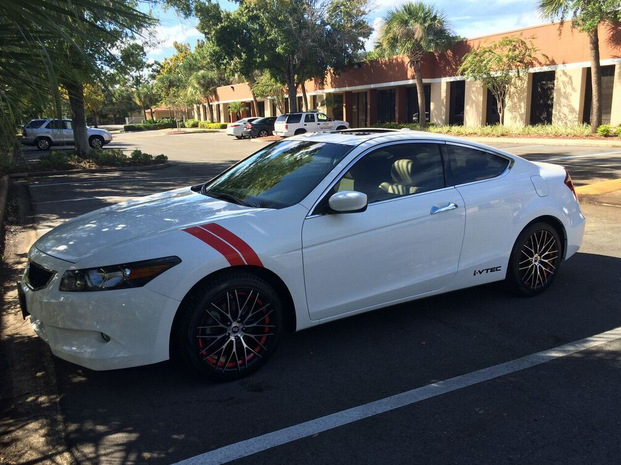 The owner of this handsome Honda Accord contacted us looking for vehicle graphics. After an initial consultation during which we listened closely to the client’s goals and budget, we made recommendations that aligned perfectly with their vision. This job was relatively simple. Our customer wanted some simple custom graphics that would give their Honda Accord a little pop. We are the experts at customizing your ride. 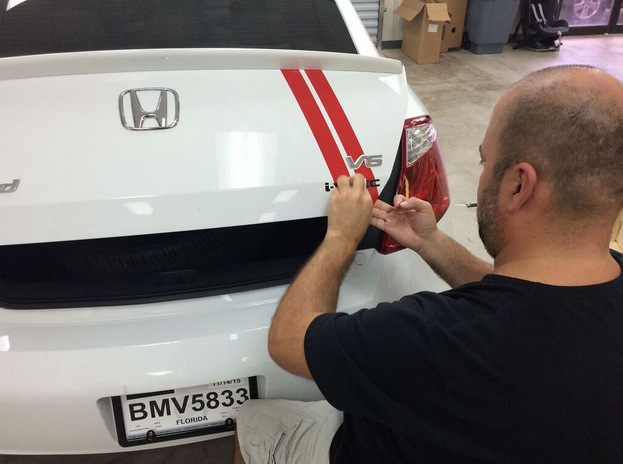 We produced and installed rally stripes for the trunk lid and fender. In addition, the driver is a bit of a gearhead and wanted to show off that the car utilizes Honda’s state of the art i-VTEC system, so we also supplied them with the i-VTEC logos and professionally installed them. In the end, the client was impressed with the job we did. Let Us Customize Your Honda Accord with Vehicle Graphics! Carbon Fiber Wraps – An interior option for many luxury vehicles is carbon fiber. These days, you can also have this luxury look on the outside of your car. Covering the hood and side view mirrors with carbon fiber vinyl wraps is a favorite request. Though black is the most common carbon fiber color, red and white are also available. Color Change Wraps – After months of research, you have finally decided on what car make and model you want. The only problem is you cannot find it in the color you want, or maybe, the paint job is terrible. Either way, you can have any color you want when you choose a full color change wrap. This is much less expensive and faster than a paint job. Vinyl Decals – You can combine any of the above alternatives with custom car decals. We know you have a need for self-expression. We provide you with the decal display that is ideal for you. We can supply car decals that represent your attitude whether you want to be thought provoking, tongue-in-cheek humorous, or just plain funny. Perforated Vinyl – You can keep passersby from looking into your vehicle while giving your car a stylish look with window perf. Musicians use this to keep onlooker from seeing their expensive equipment. If you are inspired to transform your commuter car from boring to amazing, Citrus Sign Studio can help. Contact us today for a free consultation on how to customize your ride with vehicle graphics in Orlando, FL.